Dr. Dennis Brown, Lee College President; Mark Himsel, Lee College Regent; Judy Jirrels, Lee College Board of Regents, Secretary; Jessica Falla, Lee College HSI STEM Grant Success Coach; Susan Moore-Fontenot, Lee College Regent; Victoria Marron, Lee College Executive Directory HSI Initiatives; Pete Alfaro, Lee College Board of Regents, Chair; Gina Guillory, Lee College Regent; Michael Pounds, Lee College HSI STEM Grant College Completion & Transfer Coach; Gilbert Santana, Lee College Regent. When Lee College was recognized this week with the American Association of Community Colleges’ Award of Excellence in the category of Advancing Diversity, the honor reflected innovative work by people and departments across campus. Joining Brown in receiving the award were Lee College’s Executive Director of Hispanic Serving Institution Initiatives Victoria Marron, Executive Vice President Dr. Christina Ponce and Vice President of Workforce and Corporate Partnerships Dr. Angela Oriano. Victoria Marron said the efforts to improve the college experience for historically under-served populations benefits all students. “We’re really trying to plan for the future growth, not just of our community, but of the college and addressing our growing Hispanic population is important for us as a college,” she said. In making the award, the AACC statement said, “Lee College has taken a strategic, proactive approach to addressing inequities hindering the persistence of its under-served students, especially the growing Latino population. “With a grant from the U.S. Department of Education Hispanic Serving Institution division, coupled with other funding sources, the college established a centralized Hispanic Serving Institution Initiatives Department. “The HSI Initiatives Department allows the college to provide students with a centralized hub to take advantage of academic support,” the statement continued. One of the innovative programs Lee has implemented is Weekend College which enables people who are working full-time to attain an associates degree or technical certification in 24 months or less by attending class on Friday evenings and Saturdays. Lee College’s Weekend College has achieved a three-year graduation rate of 70 percent, far exceeding the 20 percent three-year graduation rate for Texas community college students overall. The First in the World grant requires research comparing student outcomes in the grant-funded program with similar students in traditional programs. Marron said the Weekend College students have shown higher GPAs and higher graduation rates in that research. Marron said the Lee College designation as a Hispanic Serving Institution is through the U.S. Department of Education. Criteria include that at least 25 percent of full-time students are Hispanic and that the institution’s students are eligible to receive Pell grants. The designation makes the college eligible for some additional funding sources and requires an effort to streamline and improve services. “Advancing diversity doesn’t mean that we’re saying we’re as diverse across campus as we need to be, rather we’re advancing to the point of where we’re going to be. Lee College was also a finalist in the award for College and Corporate Partnership. Joining Brown in receiving that finalist award were Bob Cautadal, manager of the ExxonMobil Chemical Plant, and Connie Tilton of the ExxonMobil Public Affairs Office. Lee College has been honored by AACC multiple times in recent years — in 2017 as an AACC Award of Excellence Finalist for Advancing Diversity, Faculty Innovation and Outstanding College/Corporate Partnership. In 2016 as an AACC Award of Excellence Finalist for Faculty Innovation, Exemplary Board/CEO and Outstanding College/Corporate Partnership, and in 2015 as an AACC Award of Excellence Winner for Student Success as well as an AACC Award Finalist for Exemplary Board/CEO. 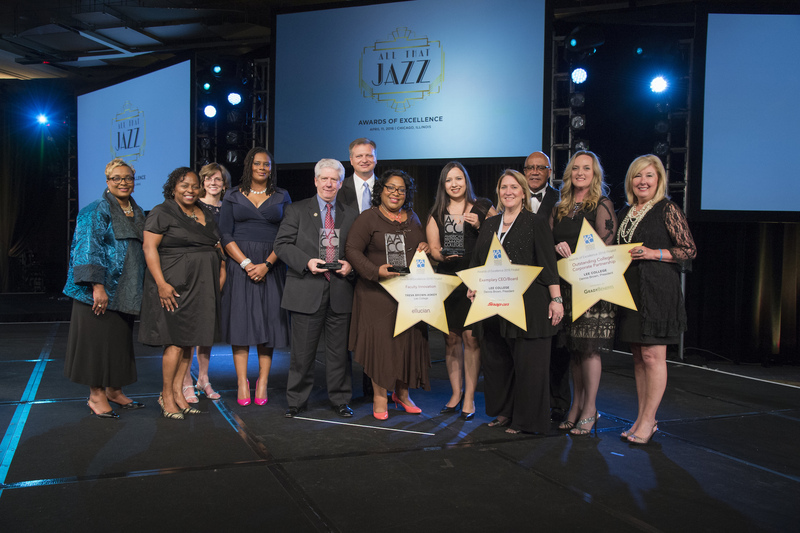 Lee College was presented with three awards from the American Association of Community Colleges as a finalist for national Awards of Excellence in three separate categories: Advancing Diversity, Faculty Innovation and Outstanding College/Corporate Partnership. The awards were displayed to the community at the May meeting of the Lee College Board of Regents. Pictured, from left: Connie Tilton, Woody Paul and Brian Nagel of ExxonMobil; Pres. Dr. Dennis Brown; Interim Vice President of Instruction DeDe Griffith; former Board of Regents Chairman Ronn Haddox; Grant Director Victoria Marron; Interim Dean of Academic Studies David Jaroszewski; Executive Vice Pres. Dr. Christina Ponce; Director of Workforce Development Marsha Tuha; 2017 graduate Jazmine Rodriguez; and Dean of Applied Sciences Layton Childress. BAYTOWN, TX — Lee College has been honored as a finalist for the 2017 American Association of Community Colleges (AACC) Awards of Excellence for Advancing Diversity, Faculty Innovation and Outstanding College/Corporate Partnership. It is the second consecutive year that Lee College has earned national recognition as an AACC Awards of Excellence finalist in three of five total categories — a rare feat among the nearly 1,200 community colleges that are members of the association and eligible for the awards each year. The AACC presented Lee College with the three finalist award trophies in April at its annual convention in New Orleans. 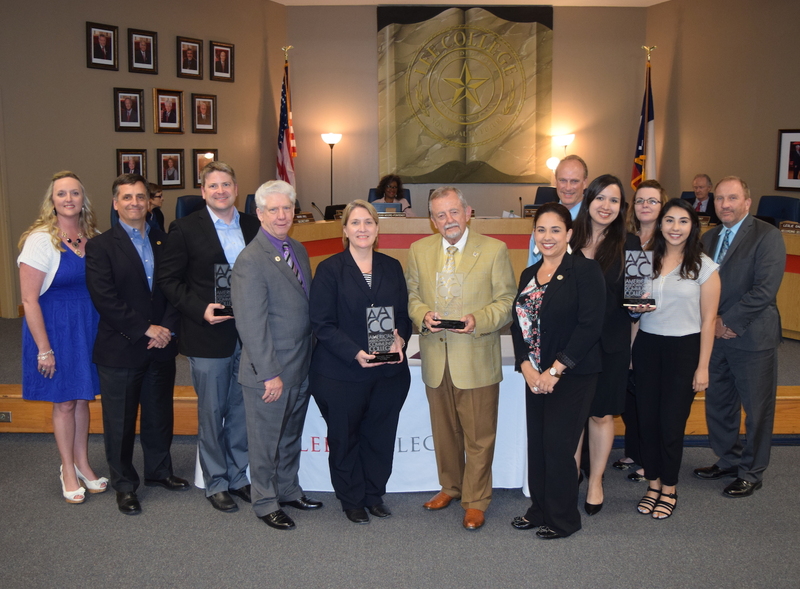 The awards were displayed to the community this month at the regular meeting of the Lee College Board of Regents. The AACC Advancing Diversity Award recognizes the college that has contributed significantly and over a sustained period of time to advancing diversity in community college leadership, the community and within higher education as a whole. Lee College was honored for the success of the Puente Project, an academic mentoring program that aims to increase the number of educationally under-served students who transfer to and enroll in four-year colleges and universities, earn college degrees and return to their communities as leaders and role models for new generations. Puente students — many of whom are low-income or the first generation in their families to attend college — have presented research at academic conferences, taken leadership roles on campus, advocated for social justice and volunteered their time and talents to serve and uplift the local community. More than a dozen Puente graduates have gone on to pursue bachelor’s degrees at universities around the state since Lee College became the fourth community college district in Texas to host the program. Treva Brown-Askey, chairwoman of the Developmental Education Division, was the college’s nominee to receive the AACC Faculty Innovation Award, which recognizes faculty members who have demonstrated leadership in the development and implementation of a campus program that has had positive impact on the learning experience for students. The outcome of the program must result in the improvement of student completion numbers within a course or degree field, and nominees for the award are expected to demonstrate an ongoing commitment to student access and success. Brown-Askey was also nominated and named a finalist for the Faculty Innovation Award in 2016, due in large part to her efforts to make educational opportunities more equitable for all students and create opportunities for students to learn and be successful both inside and outside of the classroom. Additionally, she has led and coordinated the “College Bound School” partnership with Drew Elementary School in the Crosby Independent School District, which is part of the ongoing Cradle to Career Network effort to create a college-going culture for local youth by engaging all members of the community in providing wraparound support as students transition into college. The AACC Outstanding College/Corporate Partnership Award honors local, regional and national collaboration between a college and corporate partner that has achieved demonstrable, multi-year success in advancing the mission of the institution; the economic prosperity of a community, region or the nation; and the learning excellence of students. Lee College highlighted its longstanding partnership with ExxonMobil, which has provided resources to support the education and workforce needs of Lee College students and the community for 82 years. In just the last 5 years, ExxonMobil has enhanced its support by sponsoring the Lee College EnergyVenture camp for middle-school students exploring careers in science, technology, engineering and mathematics; continuing to provide 3-to-1 matching gifts from its foundation for donations made to colleges and universities by employees and retirees; providing annual gifts of $125,000 to help meet the needs of the college’s petrochemical and technical studies programs; supporting capstone internships for students; and providing $1.8 million for the Community College Petrochemical Initiative. ExxonMobil staff members also come to classes to share their insights and experiences with students, participate in panel discussions and serve on college committees. BAYTOWN, TX — Lee College has been announced today as a national finalist for the American Association of Community Colleges (AACC) Awards of Excellence in three separate categories: Advancing Diversity, Faculty Innovation and Outstanding College/Corporate Partnership. It is the second consecutive year that Lee College has been named an AACC Award of Excellence triple finalist. Nearly 1,200 two-year, associate degree-granting institutions across the United States are members of the AACC and eligible for the Awards of Excellence each year. The winners for the 2017 awards cycle will be announced in April at the 97th annual AACC convention in New Orleans. The AACC Advancing Diversity Award recognizes the college that has contributed significantly and over a sustained period of time to advancing diversity in community college leadership, the community and within higher education as a whole. This is the first year that Lee College has been named a finalist in the Advancing Diversity category. 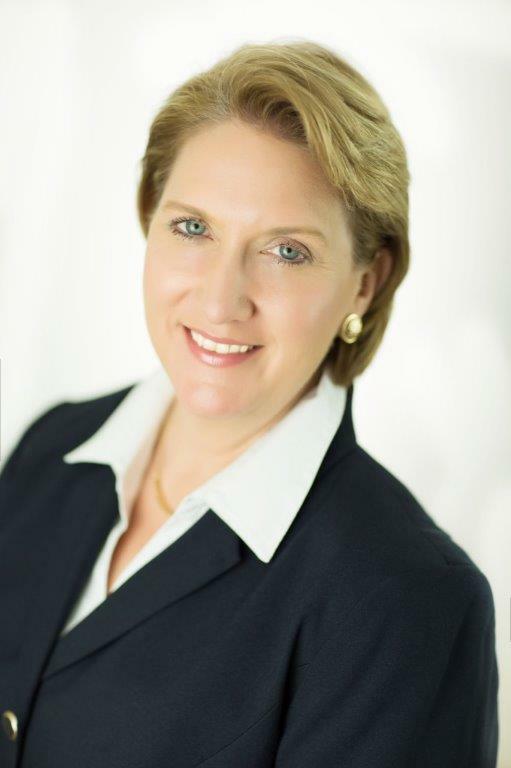 Treva Brown-Askey, chairwoman of the Developmental Education Division, has been nominated to receive the AACC Faculty Innovation Award, which recognizes faculty members who have demonstrated leadership in the development and implementation of a campus program that has had positive impact on the learning experience for students. The outcome of the program must also result in the improvement of student completion numbers within a course or degree field, and nominees for the award are expected to demonstrate an ongoing commitment to student access and success. Brown-Askey was previously named a finalist in the Faculty Innovation category in 2016. The AACC Outstanding College/Corporate Partnership Award honors local, regional and national collaboration between a college and corporate partner that has achieved demonstrable, multi-year success in advancing the mission of the institution; the economic prosperity of a community, region or the nation; and the learning excellence of students. Lee College was previously named a finalist in the Outstanding College/Corporate Partnership category in 2016. Lee College was chosen as the winner of the 2015 AACC Award of Excellence for Student Success for its work to engage the entire campus and community in creating a college-going culture that ensures a successful student experience from high school through higher education. Lee College was also a national finalist for the AACC Award of Excellence in the Exemplary Board/CEO category in both 2015 and 2016. BAYTOWN, TX — Lee College grant director Victoria Marron was one of 22 community college administrators from around the country selected for the 2016 National Community College Hispanic Council’s (NCCHC) Leadership Fellows Program, which aims to develop a pool of highly qualified Hispanics and assist them in attaining high-level positions in community colleges. As part of the program, Marron traveled to the University of San Diego School of Leadership and Education Sciences for two residential seminars. She prepared an individualized professional development plan, engaged in a mentoring relationship with a Hispanic community college leader and attended the NCCHC Leadership Symposium, where she also completed online activities between sessions. “Assisting in creating policies, offering services and helping students is part of my core,” said Marron, who oversees the college’s $2.7 million U.S. Department of Education First in the World Grant and more than $5.3 million in federal Hispanic-Serving Institutions STEM Grant funding, while also serving as coordinator of the Puente Project mentoring program for academically under-served students. NCCHC is an affiliated council of the American Association of Community Colleges, a national organization that has provided leadership to the community college movement for more than 50 years. The council works to promote the educational interests and success of the Hispanic community and emphasizes access, equity and excellence for students and staff in community colleges. Marron is one of more than 250 NCCHC Leadership Fellows who have graduated from the program since its inception. Of the original 72 Fellows, more than 15 are now community college presidents and many others have moved to positions of increased responsibility as executive-level administrators. Lee College was recognized at the American Association of Community Colleges (AACC) Annual Convention, held April 11, 2016, in Chicago, for being an Awards of Excellence finalist in three categories. Pictured, from left: Dr. Charlene Dukes, chairwoman of the AACC Board of Directors; Vera Walker, student support adviser; Dr. Cathy Kemper-Pelle, vice president of Learning; Dr. Daria Willis, dean of Academic Studies; Dr. Dennis Brown, president; Paul Guilfoyle, ExxonMobil North American Growth Project; Treva Brown-Askey, chairwoman of Developmental Education; Dr. Christina Ponce, vice president of Student Success, Workforce & Resource Development; DeDe Griffith, director of Student Success; Dr. Walter G. Bumphus, president and CEO of the AACC; Connie Tilton, ExxonMobil Baytown Area Public and Government Affairs; and Debi Jordan, executive director of the Center for Workforce and Community Development. BAYTOWN, TX — Lee College received national recognition as a 2016 American Association of Community Colleges (AACC) Award of Excellence finalist in three categories: Exemplary Board/CEO, Faculty Innovation and Outstanding College/Corporate Partnership. Nearly 1,200 community colleges are members of the AACC and eligible for the Awards of Excellence. Finalists and winners for 2016 were presented with their awards in April at the association’s Annual Convention in Chicago. Lee College won the AACC Award of Excellence for Student Success in 2015 for its work to engage the entire campus and community in creating a college-going culture that ensures a successful student experience from high school through higher education. Lee College was also one of four national finalists for the 2015 Award of Excellence in the Exemplary Board/CEO category.